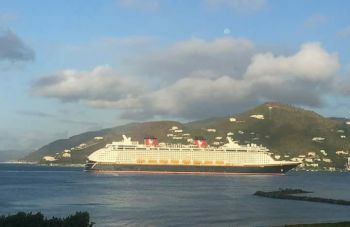 ROAD TOWN, Tortola, VI - Today, Tuesday August 28, 2018, marks the return to Tortola, Virgin Islands (VI) of the Cruise liner by Disney. Following Hurricanes Irma and Maria that destroyed the Territory in 2017 the tourism sector took one of the biggest hit. We hope that stake holders are happy, as to some at the Tortola Pier Park (TPP), it seems more like confusion than satisfaction, however, it’s better to have the ships than not to. Hey mom, if you go on Tortola website, just want you to know Cydni and I are in the B.V.I. having lots of fun. Shopping and sightseeing before we have to board ship for next port of call. Will DM you pictures later. This message proves that the world is reading our blogs. So people please display some level of intellect in your posts! With all the big hype about this shop returning. I hardly see any tourist in Road Town today. Who is really benefiting from the visit of these ships? So you could just dm your mom that? They clean up for them not for me!